Chapters of the book are devoted to maps related to public safety, public policy, national mapping and statistics, education, health, the environment, and humanitarian work. 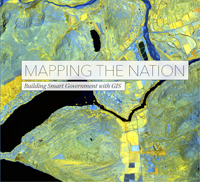 Redlands, California—Mapping the Nation: Building Smart Government with GIS, a new book from Esri, illustrates the many ways government uses maps created with geographic information system (GIS) technology to create safer, healthier, and more resilient communities. The sixth in Esri's Mapping the Nation series, the book includes a collection of more than 100 full-color maps, 50 of which were generated by the US federal government. The maps also can be viewed on this companion website. GIS technology provides government agencies with tools to analyze and visualize data, producing the results in the form of maps. Chapters of the book are devoted to maps related to public safety, public policy, national mapping and statistics, education, health, the environment, and humanitarian work. Readers will see how organizations as diverse as the Centers for Disease Control and Prevention (CDC), the United States Air Force (USAF), Fire Department New York (FDNY), the World Bank, and the US Congress use GIS technology to create informative maps for decision makers or the public. For example, GIS was used to create a map-based security planner platform that helped FDNY monitor events held during Super Bowl XLVIII in New York. Also, the CDC created publicly available online maps of heart disease rates in the United States by age, ethnicity, and other factors. And staff for several United States senators have created GIS web maps to show constituents the locations of wildfires in their states, areas that are underserved by public transit, and US Environmental Protection Agency (EPA) cleanup sites. "In this book, you'll discover real examples of how users are applying GIS to implement smarter practices and address our global challenges," says Esri president Jack Dangermond. "You'll see that GIS provides amazing ways to analyze, visualize, and communicate the complexities of data to everyone and make a difference in our future." Mapping the Nation: Building Smart Government with GIS (ISBN: 9781589484528, 148 pages, $19.99) is available at online retailers worldwide, at esri.com/esripress, or by calling 1-800-447-9778. Outside the United States, visit esri.com/esripressorders for complete ordering options, or visit esri.com/distributors to contact your local Esri distributor. Interested retailers can contact Esri book distributor Ingram Publisher Services.